%WESTERFIELD_MODELS_SECURE _MODEL_STORE% - 10201 U-5 PHOSPHATE CAR, ORIG. Operating Era: 1923-1970. Atlantic Coast Line, Seaboard Coast Line. 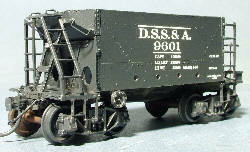 The U-5 was Atlantic Coast Line's first all steel "dry" phosphate hopper car. Three hundred cars of series 8175-8474 were built in 1923-26 and ran in revenue service until 1968. The cars had 8 roof hatches and 4 hoppers. The hopper doors were originally operated individually by chains wound around rods. These were replaced sometime in the late 1930's with collapsing rods that were connected together so that a single operation could open and close all doors. The cars were given AB brakes and a new lettering style in 1948. Lettering changed again the the 1950's. In the 1960's cars were shifted to locomotive sand service where they lasted into the late 1980's. Decal Set Available. Notify me of updates to 10201 U-5 PHOSPHATE CAR, ORIG.